For those who aren’t familiar with the phrase, painting en plein air is just a fancy way of referring to painting on location, usually outdoors. It’s a challenge! In addition to all the usual problems a painter has to solve (composition, color mixing, brush handling, etc. ), there is the constantly changing light, the sun, rain and wind, the bugs, the passers-by. At this point, I love chatting with the passers-by, but at first it was nerve-wracking to paint with someone looking over my shoulder. So what, you may be asking, is such a topic doing here? Here in the Land of No Skills Needed? Ah. I tried an experiment this week that I can’t wait to share with you. I discovered that ANYONE can paint en plein air! Remember the article about Wonky Wobblies and Directed Doodles? If not, it’s okay. I think you’ll get the idea without reading it, but that is the exercise that my experiment evolved from. On the day of my experiment I was out painting, but the humidity was high and I was having a hard time getting my washes to dry. While I was waiting to add the next layer to a little watercolor study, I decided to just play around with capturing the colors around me. I flipped to a page that had a creative seed with some of the colors I was seeing around me, and starting splashing on bright colors at random. All I did was look around and pick a color or color combination that appealed to me, and “scribble” or “doodle” some of those colors on my journal page. No attempt to make anything look like anything. I just wanted to capture the brilliant color. The page I chose to work on. After I put down some more yellows, oranges and greens at random, the page was pretty wet, so I went back to my field study. When I again reached a point where I had to let my field study dry, I glanced over and noticed how appealing my color scribbles were! The journal page was nearly dry, so I mixed up some darker color, and again looking all about me, this time I tried to capture shapes I was seeing. Not trying to make a painting, just seeing a shape. Looking around on the page for a spot where I had some empty space or a light color I could paint on top of, I started making some watercolor “doodles” using my shapes. Repeated brush marks to imitate the shapes of tall, skinny poplars in the distance, branch-y shapes, weed-y shapes. Whatever shapes I happened to be seeing around me. Not—definitely not!—trying to paint trees or weeds or hills. Certainly not trying to paint a scene. Just doodling and repeating some of the shapes I found interesting, very much like the Directed Doodle process, but with a brush rather than a pen. Then I went back to my field study and didn’t really look at my journal again until I was packing up to leave. My journal page after “watercolor doodling” colors and shapes I was seeing all around me. It’s not a landscape painting . . . or maybe it is! Whatever it is, I like it! A lot! It really captures some of the feel of the day, although it doesn’t look much like the place I was painting. Best of all, it was sooooo easy! I didn’t labor over getting anything right. No worrying about perspective or reserving lights or mixing color. I was trying to capture some of the color and shapes around me, but I wasn’t trying very hard. Just as with Directed Doodles, I was mostly just enjoying the brush on the paper while I waited for my study to dry enough for me to continue work. I liked it so much I went out and did two more the next nice day. 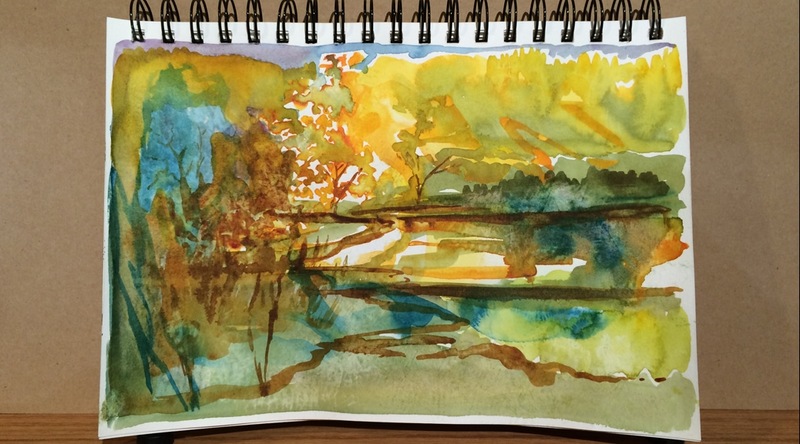 Another watercolor plein air Directed Doodle. I’ll be interested to see what you all think of them as paintings, because I’m finding I really, really like them. Maybe enough to completely change the way I paint en plein air. But I suspect the real reason I like them so much is that I spent nearly all of my time immersing my whole attention in what I was seeing and really savoring the beauty all around me, rather than worrying about “making a painting”. And that’s an experience worth having, whether you “paint” or not. The fall color season here is winding down a bit, but there is still a lot of beautiful color out there. Get out and give it a try; I promise you’ll be glad you did!